21 current members were present. Jim was voted in as a new member. Vince joined us for his first meeting after speaking with us at Art of Beer and Beerology. 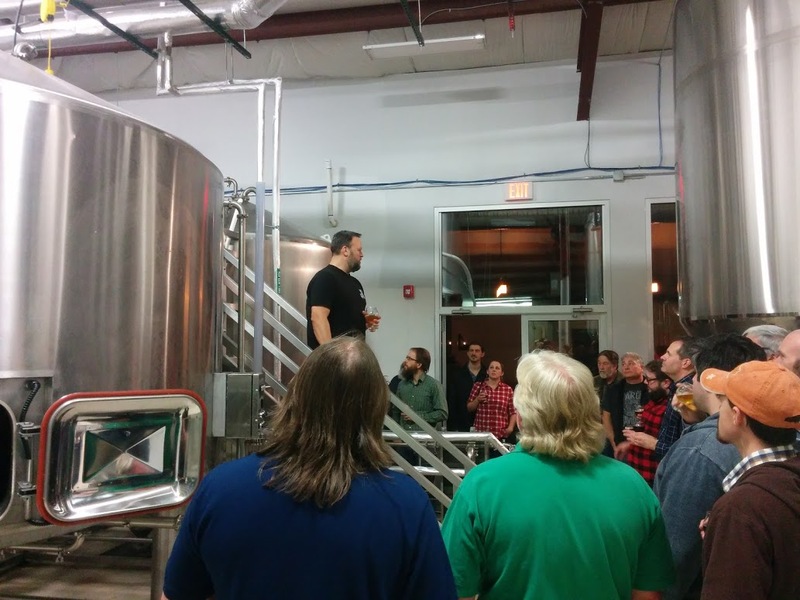 February’s Social was at 12 Gates Brewing Company and Rob Haag guided us on a personal tour. It was also Taco Tuesday! The next business meeting will be held on Tuesday, April 26, 2016 at 7:00 PM at Crazy Jake’s. April’s social was recommended by Alex Placito. We will visit Blue Monk for the last time as a group on April 12. Should they close their doors prior to that, we’ll call an audible and the social will be at the Tavern at Windsor Park. May’s social will be at Lockhouse Distillery and will include the Sultans of Swig and the Buffalo Beer Goddesses. Registration for Brewers is closed and we broke 600 entries once again. Judges and Stewards may still sign up until March 30th. Brewers’ Night Out (our annual awards banquet) is April 2 and the deadline on discounted tickets has been extended until March 30 when our final count is due. The Sponsors List keeps growing and we’ve got some heavy hitters on board with some serious prizes. For tickets and more information, visit our Brewers’ Night Out page. The Art of Beer and Beerology on back-to-back nights made for a busy weekend, but the foot traffic and interest in the club was impressive. We brewed an American Mild (using NY Craft Malt) at Beerology that will be served at AWOG. “Brew at the Bison” will tentatively be June 11 in the Flying Bison parking lot. We’ll look into generating generate some publicity out to the general public in case they want to see homebrewing in action. A good amount of discussion took place regarding BJCP exams and the associated prep classes. There seemed to be a fair amount of interest in the classes, but we need an organizer. A core group of judges is always happy to help guide the classes, but we need someone to find a venue, pool funds from participants, and organize beer purchases class-by-class. Each student should be prepared to present a technical topic to the class at least once throughout the 10 sessions. Judges will help by comparing and contrasting styles, helping with palate development and descriptors, and focusing on the following aspects of the exam score sheet: perception, descriptive ability, scoring accuracy, completeness, and feedback. In addition to stewarding, judging, and practicing on your own, this is the best venue to learn to become a judge or increase your BJCP rank. Email Tim Belczak (tim@belczak.net) if you are interested in the class. We’d like to find an organizer ASAP and start classes mid-April so it’s a relaxed (bi-weekly) pace leading up to the October 1 exam. Judges are needed in Rochester for UNYHA’s competition. We’ve sent out emails asking for help as well. They send a fair amount of judges our way every year for AWOG and we need to do our part to reciprocate. Judging will be April 9 at the Fairport Brewing Company. It’s late notice, but the Erie County Fair just registered their homebrew competition on the BJCP website. Entries are due at the Hamburg Farigrounds by Friday April 8th and judging will take place April 23. If you can help judging or stewarding, you may hand-carry your entries the morning of judging as long as you arrive a little early. More info can be found here and please contact Tim Belczak (tim@belczak.net) if you can judge or steward. Plenty of help is needed. A general reminder was given to clean up the meeting room as you leave (take bottles home to reuse or recycle if possible). The meeting room has looked great recently and thank you to everyone who pitches in! A general reminder was given to make sure you square up any tabs at business meetings or social events. Members who stick around later at these events end up footing the bill. It’s not a common occurrence, but something to be conscious of. Three members of the Buffalo Beer Goddesses joined our meeting and were the guest judges for this year’s random trios, which was a fantasy draft theme where we drafted ingredients and brewed two distinct beers. We did not end up with enough participants to fill 8 teams, so we only ended up with four brewers on a team and one round of judging instead of a bracket. A big thanks to Albe Pilon for organizing this annual event! March’s style was Bock beers and Mike Conley gave a great overview of the style with examples from Spaten and Bell’s. April’s style will be California Common, presented by John DePaolo. No one volunteered to present a style in May. If you want to present a style and perhaps brew an example of your own to go along with your presentation, contact Tim Belczak to get on the list. We’d like to fill the list up several months in advance to give members the opportunity to brew an example for the presentation if they desire. If you’re not an expert, this is a great way to lean a style and educate others. The club pays for the beer and you can find all the information you need on the BJCP website. New presenters are always encouraged.